The air is crisp and our fall kitchen always includes apples and pumpkins. Camilla Saulsbury has brought us two recipes: this Spiced Pumpkin Bread and an Apple Pie Cake. What they have in common is that they both use chickpea flour, which is a great alternative to those looking to avoid grains and classic flours. In The Chickpea Flour Cookbook she covers sweet as well as savory cooking and baking based upon the mighty chickpea in flour form, which as far as I know is the first such exploration. This bread, with its texture-filled topping of pumpkin seeds, is a wonderfully moist option using coconut oil as the fat. 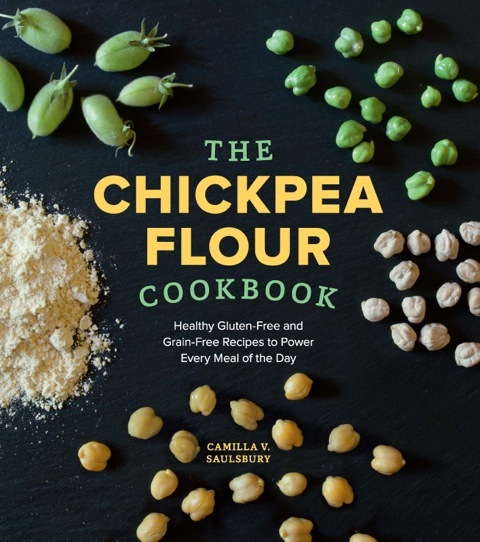 Reprinted from The Chickpea Flour Cookbook by Camilla Saulsbury (Lake Isle Press, 2015). Recipes and photography copyright Camilla Saulsbury. 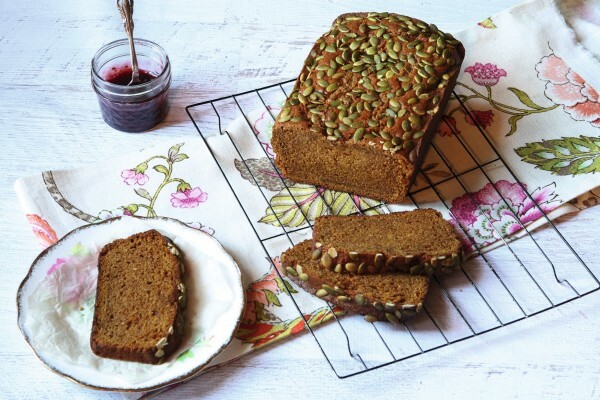 It’s unlikely that I’ll ever refuse a slice of pumpkin bread, but this is the one I crave. Moist, not too sweet, perfectly spiced, and very pumpkin-y. The extra boost of protein and fiber from the chickpea flour also makes it one of my favorite instant (yet lasting) high-energy, on-the-go breakfasts. Preheat the oven to 350°F. Line a 9 by 5-inch loaf pan with parchment paper, leaving a 2-inch overhang on two opposing sides. Spray the paper and exposed sides of the pan with nonstick cooking spray. In a large bowl, whisk together the flour, pumpkin pie spice, baking soda, baking powder, and salt. In a medium bowl, combine the eggs, pumpkin, sugar, and coconut oil until well blended. Add the pumpkin mixture to the flour mixture and stir until just blended. Spread the batter evenly in the prepared pan. Sprinkle the top with the pepitas. Bake for 55 to 60 minutes, until a toothpick inserted in the center comes out clean. Let the bread cool in the pan on a wire rack for 10 minutes, then hold on to the paper overhang to transfer it directly to the rack to cool completely. Remove the paper and serve. An equal amount of olive oil, melted unsalted butter, or neutral vegetable oil can be used in place of the coconut oil. An equal amount of coconut palm sugar or packed light brown sugar can be used in place of the natural cane sugar. Tent the bread with foil during the last 10 minutes of baking if the bread becomes too brown. Chocolate Chip Pumpkin Bread: Add 1/2 cup miniature semisweet chocolate chips to the batter. Pumpkin Cranberry Muffins: Add 2/3 cup dried cranberries to the batter. Divide the batter among 18 greased muffin cups (in 2 standard muffin tins). Bake for 11 to 15 minutes. Store the cooled bread, wrapped in foil or plastic wrap, in the refrigerator for up to 5 days. Alternatively, wrap it in plastic wrap, then foil, completely enclosing the loaf, and freeze for up to 3 months. Let thaw at room temperature for 4 to 6 hours before serving.